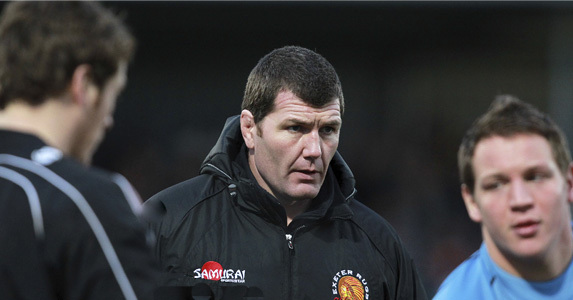 It did not make for pretty viewing and having scrutinised the video nasty of last weekend’s loss at lowly Leeds Carnegie, Exeter Chiefs head coach Rob Baxter is confident his side can rediscover their form in Saturday’s derby encounter with Bath at the Recreation Ground (2.30pm). Baxter was less than impressed by the way his side went down 27-22 to the Aviva Premiership’s basement club and promised to use this week as the ideal opportunity to address some of the issues which have crept into his team in the past fortnight. True to his word, Exeter’s leader has sat down both individually and collectively with his players and talked over those specific areas – Baxter now expects a response against a Bath outfit who narrowly edged the corresponding fixture in February 12-9. “If there’s one thing we did wrong as a group, it was that we got a bit carried away with what a win would have given us,” Baxter said of last week. “All week people were saying: ‘If Exeter win they’re mathematically safe, the season then has been a success’. “For the first time we got too forward-thinking in what the result would bring, rather than concentrating on the bits and pieces that would bring the result. “One of our biggest strengths all season has been that all we have talked about is going to clubs to play well, and if we do that we’re happy. That’s led to us winning some games and getting losing bonus points from others, but we were focused on working on our performance. We’ve refocused on that this week. Although the Chiefs head into this Westcountry tussle on the back of defeats against London Irish and Leeds Carnegie, Bath themselves are also on a losing streak of their own having slipped to successive defeats against Gloucester, Leicester Tigers and, more recently, Saracens. That sequence of results has meant Bath are now hanging on by their fingernails to the hopes of reaching the end-of-season play-offs. For that to happen they are well aware they will have to do the double over the Chiefs and Baxter hopes the pressure that brings will work in Exeter’s favour. “We’ve got to play on that very much – we’ve got to say this is a big game for Bath,” he said. “If that puts them under pressure and 30 minutes in we’re playing well, let’s see how they deal with the pressure. Ahead of kick-off the Chiefs have made changes to their line-up which lost at Headingley a week ago. In the back division, Matt Jess takes over on the wing from Fijian powerhouse Nemani Nadolo, whilst the club’s other Fijian star Sireli Naqelevuki has passed fit for duty and will replace Bryan Rennie in the Exeter midfield alongside Jason Shoemark. Up front, prop Hoani Tui comes in for his 11th start of the season as Chris Budgen is unavailable due to commitments with the British Army and top try-scorer Tom Johnson is recalled at flanker in place of James Phillips. Tui’s elevation from the bench means Argentine forward Ignacio Elosu is added to the match-day 23 – as is scrum-half Garrick Cowley who replaces former Bath player Haydn Thomas.